Having arrived back from Slovenia here are a few lines about our experiences! This corner of Europe, known affectionately as the sunny side of the Alps, must be one of the Germans' best kept secrets when it comes to kayaking. The turquoise Soca river bathed in glorious sunshine with snow capped peaks all around is a mecca for German speaking kayakers and we wanted to experience it too. We flew to Ljubljana, hired a car, and spent a couple of days sightseeing around the beautiful Lake Bled before driving over to Bovec in the Soca valley to do some canoeing. The group was Fiona Reid, Mark Sloan, David �Turtle� Pite, Peter and Hilary Lawrence, the five of us plus luggage all managed to squeeze into a Ford Focus Estate � somehow! We spent three days on the water with another day canyoning and one day walking. We had opted to take all our personal canoe gear plus helmets, spraydecks and buoyancy aids and hire kayaks and paddles for the days we needed them. We found the Slovenians pretty laid back and quite happy to hire kayaks to people they didn�t know. We opted for a guide �Joze� for our first two days as there were no English guidebooks to the region. The get in was west of Bovec at the Zicnica Golobar, a Telephar constructed in the 1st World War for transporting logs etc. Last used in 1968. The get in was on the right hand side of the road as you drove up the valley about 1km from the village of Kal Koritnica. The boats had to be carried for about 100m down to the river and the get in was just below a gorge. We were able to paddle into the gorge and Fiona and Mark saw a small swimming snake. The water was incredibly clear, and you could see every underwater rock in some ways potentially disconcerting. We were immediately into grade 3 water. Around the first corner there was a large rock with water pushing onto it, the route was river left under the small footbridge. While Mark was playing on this rapid he got swept up against the rock and went in for a swim. More rapids, generally grade 2 or 3- took us down to the confluence of the River Koritnica. A fantastic 360o panorama unfolded of wooded hillsides and snow-capped mountains, possibly the most scenic paddle we've ever done (not a shopping trolley in sight). We stopped for lunch at the bridge at Cezsoca, which was the halfway point on the trip. The second half was easy grade 1 or 2 although the river was braided so we needed to stay awake to choose the right route and avoid trees. The beautiful waterfall �Boka� came into view on the right hand side just before the get out at the bridge. Nice rapid before the bridge, Turtle was playing here and took a swim. Again we had our guide Joze to take us down this more demanding section of the river. The get in was by the bridge at Boka where we had got out on day one. The Slovenians have very thoughtfully put in portaloos at each of the access/egress points (see photo of Fi with M&S bag) The first four kilometres was easy grade 1 or 2. Whilst surfing a wave Mark capsized and did his first ever white water roll in anger, followed by a second, what a happy bunny! We had a lunch stop just above the first serious rapid where our guide pointed out all the nasty stoppers and holes although the paddlers passing through did not seem to be having many problems with them. The river was much larger and much more powerful in the second part. The water was boily and hence a bit unpredictable. Large rocks and holes made the river grade III/IV and the guide insisted Peter keep right behind him. Pete was first to swim that resulted in him being on one side of the river and his boat on the other. By tying two throwlines together we managed to get a rope to him so he could use it to swim across the river. Not to be outdone Turtle soon took a swim and his boat ended up some way down stream. Turtle discovered it was easier to swim down the river rather than struggle through the undergrowth on the riverbank. Meanwhile Fiona�s confidence in her roll improved. Just before the get out a nasty rapid, which had most of the water hitting a rock on river right, unseated both Turtle and Peter. We only just managed to retrieve them and their boats before the start of the Grade IV+ slalom site. No sign of the sun this morning and the forecast was for rain. There had been rain overnight and the river had risen. This time without a guide we ventured out on the section we first did on day 1. There was mist rolling across the river and everything was rather eerie like the set of Harry Potter. From a distance it was hard to distinguish flat water from rapid. Only when you were on them did you know where to go! This lasted for about an hour until the rain came. The river was a lot more crowded, this being the weekend, but mostly by good natured rafters all vying for the same bits of water as us. 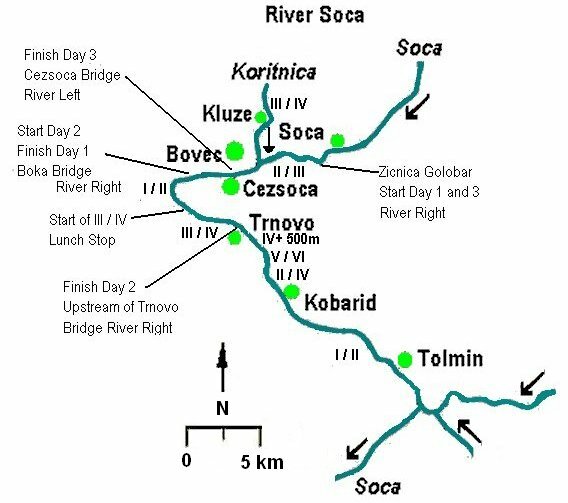 No swims today or events of any note although we did get out of our boats and carry them 20 metres up the river Koritnica to try the last rapid. By the time we were off the river it was pouring down and it didn�t stop for the rest of the day. The local language is Slovene, a south Slavic language closely related to Serbo-Croat. It�s a difficult language so the locals don�t expect you to speak it! Most people have a second language, for the older generation this was German but the younger generation tend to use English as their second language. Language wasn�t the problem we thought it might be. We didn�t take paddles or kayaks with us. However if the plan was to paddle much more than 3 days then taking kayaks on the plane would be worth considering. Failing that it might be worth at least taking your own paddles. We found that with using unfamiliar paddles some people developed blisters on hands where they normally do not get blisters. Also you can�t guarantee getting oval shaped paddle shafts. We used mainly Prijon �Fly� boats since there was a Prijon test centre next to the river. Some of us also got bruised knees from using un-familiar boats, therefore take some knee padding! We hired kayaks from Goran at Bovec Sport, he said that if we gave him plenty of notice (a month) he may be able to get hold of our required types of kayak. There is a useful gear shop in Bovec called �La Ola�. Its open early evening. For those planning on simply going to Bovec it would probably make sense to fly to Trieste in Italy rather than to Ljubljana, it�s a similar distance but there isn�t a mountain range in the way! Visiting Bled and the Vintgar Gorge, which are about 30 mins drive from Ljubljana airport are however definitely recommended. There are also some great caves and castles in Slovenia to visit. Sightseeing in Ljubljana is worth a day too.